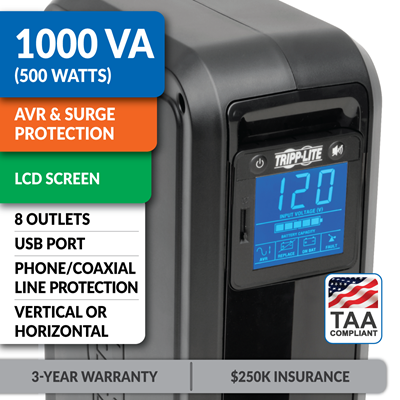 The TAA-compliant SMART1000LCDTAA SmartPro LCD 120V, 1000VA/500W Line-Interactive Uninterruptible Power Supply provides battery backup and AC power protection against blackouts, brownouts, power surges and line noise that can damage electronics or destroy data. Ideal for backing up your desktop computer or audio/visual components, this line-interactive UPS switches to battery backup mode in milliseconds to keep your connected equipment running long enough to save files and shut down safely with no data loss.While all eight NEMA 5-15R outlets protect against surges, four outlets also provide up to 3 hours of UPS battery support for a DVR component, 60 minutes of support for a basic desktop PC and LCD monitor, and 10 minutes of support at half load (250W).Automatic voltage regulation (AVR) corrects undervoltages as low as 89V without using any battery power. EMI/RFI noise filtering improves your equipment’s performance and prevents damage. A 1038-joule surge suppression rating protects your equipment from harmful power surges.Space-saving NEMA 5-15P plug with 1.83 m (6-ft.) cord connects to any NEMA 5-15R socket and allows furniture to be placed flush against the wall. Large rotatable LCD screen with dimmer shows real-time statuses at a glance. With Tripp Lite’s free PowerAlert software (available via free web download), the SMART1000LCDTAA enables safe unattended system shutdown and file saves in case of a prolonged power failure. 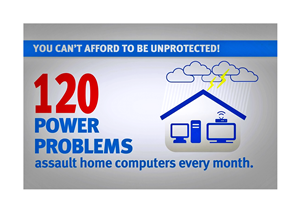 Surge protection blocks harmful transient voltages on AC, phone and coaxial lines. The 3-year warranty and $250,000 insurance reflect Tripp Lite's commitment to product quality and customer satisfaction. TAA compliance meets the requirements of GSA Schedules and other government contracts. Single-Computer Runtime: This UPS system will support an energy-efficient desktop computer and LCD monitor for up to 60 minutes during an outage. Half-Load Runtime: This UPS system will support a 50% load (250 W) for up to 10 minutes. Data lines connected to your equipment represent an unlocked "back door," allowing surges to enter and damage or destroy sensitive electronic components. In addition to protecting against surges on the AC power line, this UPS system protects your equipment against surges on connected phone and coaxial lines. The RJ11 jacks protect a telephone, analog modem or DSL modem line. The coaxial connectors protect a cable TV, satellite or cable modem line.